The innovative Eurotherm 3216 controller offers precision control of temperature and other process variables together with a host of advanced features not normally found in this class of controller. The emphasis is on simplicity and ease of use. A simple 'QuickStart' code can be used to configure all the essential functions, including input sensor type, measurement range, control options and alarms - making 'Out of the Box' operation truly achievable. The controller can have up to 4 software alarms, which include absolute high & low, deviation high, low or band & rate of change, that are auto or manual latching, non-latching or event only, and up to four conditions can be assigned to one output. An internal timer is configurable as an interval timer or delay timer; for example it can dwell when the setpoint is reached or provide a soft start for hot runner control. The Contact Input can function as alarm acknowledge, SP2 select, manual, keylock, timer functions, standby select, RSP select. The 2-wire Comms Model additonally feautres 2-wire RS-485 Modbus communication and an additional Logic input. Quick and easy commissioning with one shot auto-tuning. IP65 (NEMA 4X) rated front panel. Other models are also available within this range. 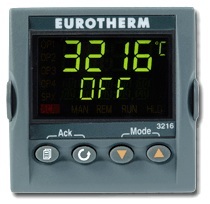 View more details of the Eurotherm 3216 - 1/16 DIN Temperature Controllers range. Other models might not be available from stock, please contact us for price and lead time.